"My beading space is a loft bed with a computer desk attached underneath it. I used to live in a small place with a tiny bedroom, and even though this bed/computer desk was meant for college students living in a dorm, it fit my needs perfectly. I do periodically try to beat back the beady beast. 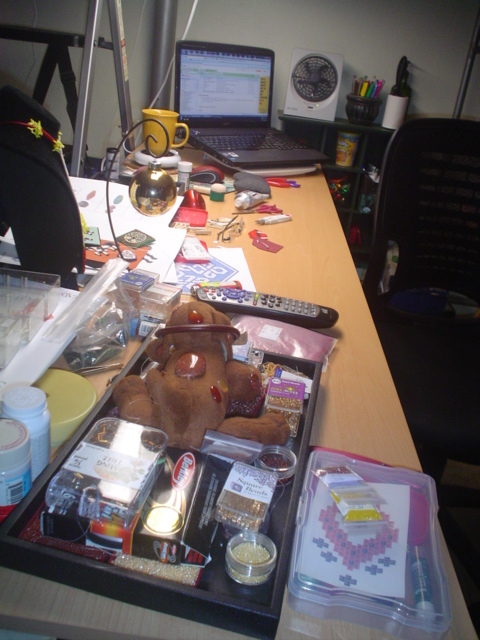 I have a set of trays that I got from Fire Mountain Gems, and I try to keep one project per tray so that the mess is a little bit organized. And I can pick up a tray and bead in my easy chair, if I so desire. 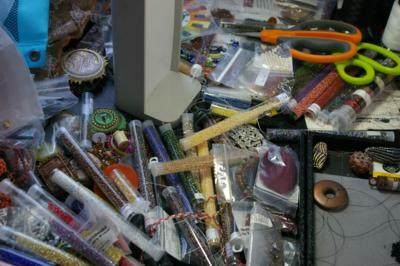 I do my best to keep the rest of my beads organized. (Don't we all say that?!) Of course, there are always the 'gremlin' beads that I find in odd places and I KNOW I didn't put them there! When I do clear off my table, I always feel a sense of accomplishment and revved up to create more! I embrace my beady chaos to a point. 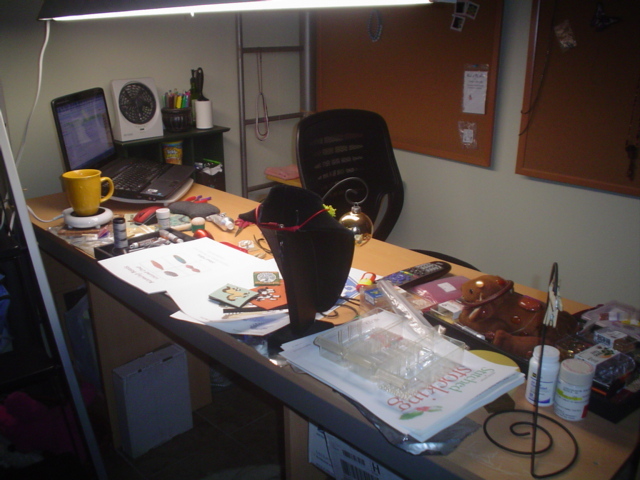 Some clutter is okay and does aid the creative process. Seeing things side-by-side, even if they are earmarked for another project, can make you stop and go, 'Hmmm...' But when it gets to the point where you can't see anything because of all the clutter, no, I most certainly do not love that. Overload the muse, and she goes on vacation!" You can see more of Candy's work in her Etsy shop, Bead of My Heart, and check out her photostream on Picture Trail. Would you like to be featured on this blog? Click on the tab at the top of this page and submit your photos and the answers to the questions there! And don't miss out on the giveaway on the Art Beads Scene blog: leave a post about your favorite storage containers and be entered to win a free set of disc beads!